The Texas Instruments' OMAP3530 is a high-performance processor based on the enhanced OMAP 3 architecture. It includes many internal subsystems designed to support high-speed, multi-thread processing applications. 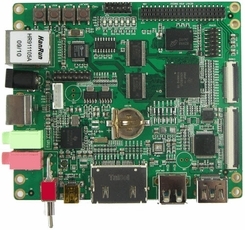 The OMAP3530 includes an integrated advanced Superscalar ARM Cortex-A8 core, an IVA2.2 subsystem with a C64x+ digital signal processor (DSP) core, 2D/3D graphics accelerator, display subsystem, a camera ISP (Image Signal Processor), and high-performance system interconnects and industry-standard peripherals. The device includes state-of-the-art power-management techniques required for high-performance mobile products and supports high-level operating systems such as Windows CE, Linux, Symbian OS and Palm OS. Embest DevKit8000 Evaluation Board is a compact board using OMAP3530 microprocessor. It takes full features of this processor and supports up to 256MByte DDR SDRAM and 512MByte NAND Flash as well as high-speed USB2.0 OTG function. The board has exposed many other hardware interfaces including RS232 serial port, LCD/TSP, DVI-D, S-Video, Ethernet, SD, keyboard, camera, SPI, I2C and JTAG. The board has two methods to boot the system from either SD card or NAND flash. It is able to support WinCE and Linux OS and provided with WinCE6.0 BSP and Linux2.6.28 BSP. Embest also provides demos of Google Android OS, Angstrom (GPE) and DVSDK for user experience. Embest DevKit8000 Evaluation Kit includes the DevKit8000 evaluation board and all necessary accessories to help users start their design of multimedia applications. The board is preloaded with Linux OS in NAND flash and WinCE OS in SD card. User can display the subsystem using a 4.3" or 7" TFT LCD and Touch screen or using a DVI-D monitor through an HDMI to DVI-D cable, or using TV for NTSC/PAL video out. The USB OTG interface can also be used as USB Host function with a Mini-A to Standard-A cable, or used as USB Device function with a Mini-B to Standard-A cable. The board has audio and video codecs, with the help of DSP, H.264, MPEG4, CIF, and D1 media formats all can be supported. Along with the kit, Embest provides user manual, schematic drawing and datasheet documents to help customers better understand and use the kit. Additionally, Embest offers various modules for Devkit8000 including VGA, WiFi, Analog Camera, GPS, GPRS, 3G and Digital Camera modules which greatly extends the functions of the board and would be flexible for customer selection to meet their own needs.